‘The Gruffalo’s Child‘ is another delightful children’s picture book by the fantastic team of Julia Donaldson and Axel Scheffler. Although it can be read as a standalone story, I think your child will get more enjoyment out of it if they have read ‘The Gruffalo‘ first. If you don’t know the story of ‘The Gruffalo’ it is basically about a small mouse who meets a number of creatures in the forest who all want to eat him! He warns them off by saying he is going to meet the Gruffalo, an extremely scary creature he has made up. All the animals are scared off; the mouse goes happily on his way until… he really does meet a Gruffalo! He manages to trick the Gruffalo into not eating him also by claiming he is the scariest creature in the forest! 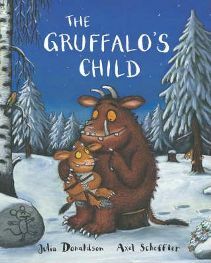 ‘The Gruffalo’s Child‘ builds on some of the ideas in the original story. At the beginning we meet the Gruffalo in his cave, warning his small child that she must never go out alone in the deep dark wood because the big, bad mouse is out there and he will eat her up! However, one night the Gruffalo is asleep and the little girl Gruffalo is bored so she decides to go out there anyway. As it is snowing, she sees tracks in the snow which lead her first to a snake, then an owl and finally a fox. (These are the creatures from the original story as well). Each time she says ‘You’re not the big, bad mouse’ only to be told where he is and that he is eating Gruffalo cake, Gruffalo pie or drinking Gruffalo tea! The child is undeterred though and continues on her way to find the big, bad mouse! A while later, after deciding it is all a trick, she comes across a very small mouse. She thinks that it is definitely not the big, bad mouse but it does look like it would make a good midnight feast! But of course, this is the very clever mouse from the original story and he is not going to allow himself to be eaten easily! He says that the big bad mouse will be along in a minute. He climbs on a tree with the moonlight behind him which causes a huge shadow over the snow! The result is that the Gruffalo’s child sees a fearsome scary creature in front of her! Suddenly she is not so brave and runs home incredibly quickly through the snow. At the end of The Gruffalo’s Child, she is back in the cave with her dad, and the small mouse is left in piece to eat his nut! And his scaly tail is terribly long. This is just one example which I think is particularly good, and as she constantly repeats the word ‘terrible’ it emphasises just how bad this creature is! The descriptions are all accompanied by very exact illustrations by Axel Scheffler. I think the illustrations of the Gruffalo and his child are particularly good – they really capture the fact that this scary looking creature is really not that scary at all! It is a clever little story too, with the small little mouse emerging as the winner again. As I said before, it would be an enjoyable book on its own, but all the better if you have read ‘The Gruffalo’ first. My little girls liked the fact that they were meeting the same characters and it made them remember things that had happened in the first book. So, all in all this is another enjoyable read – a good story that children will enjoy matched with excellent illustrations! No Comments on "The Gruffalo’s Child"